The anniversary cups now available! When Camilla and I realized that our friendship this fall celebrates ten years, we thought something special was needed to mark the anniversary. 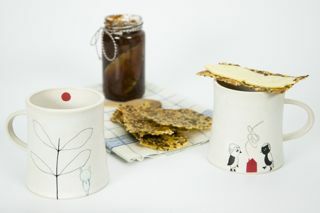 So we created a set of cups in our own specialities – Camillas illustrations paired with my ceramics. Making a set of cups feels like the ultimate way to celebrate friendship and moments of togetherness. Everything will be ready and available this Sunday in manos webshop. We’ll keep you posted! The cups are now available for purchase in manos webshop! 2nds and clearance sale now online! It’s time to clear some space for spring and new products at manos so we’re having an online sale. 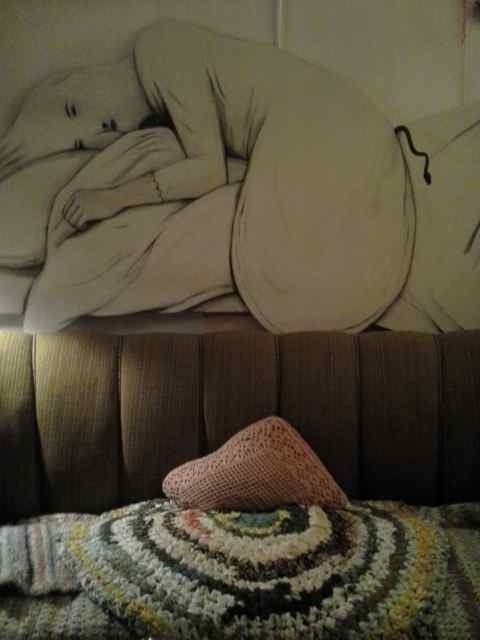 You’ll find both ceramics by Karin Eriksson, recycled bags, ecological wheat warmers, Jenny Almén’s hand illustrated cushion and Camilla Engman 2010 calendar. Five Tiny Candle Holders on sale. 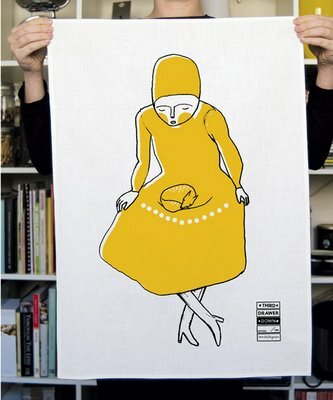 <a href=”http://www.manos.bigcartel.com”>manos has got two copies in stock of this wonderful book The book about Camilla Engman is sold out but we still have the lovely new Camilla tea towel from Third Drawer Down: Can We Dance? 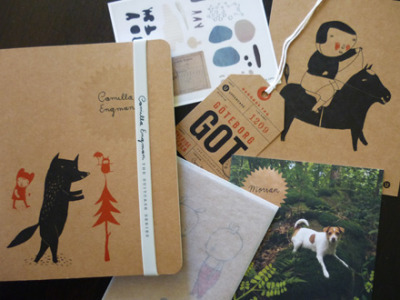 I enjoyed this interview with Abigail Crompton of Third Drawer Down on The Design Files. 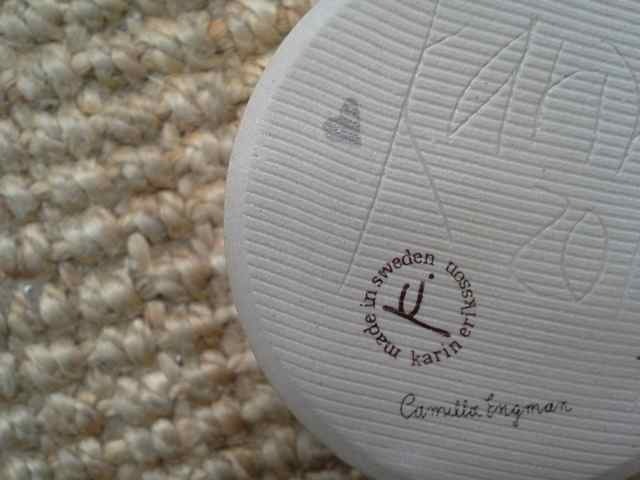 The Suitcase Series Vol 1: Camilla Engman Sold out! Dreams on the closet. Close up. 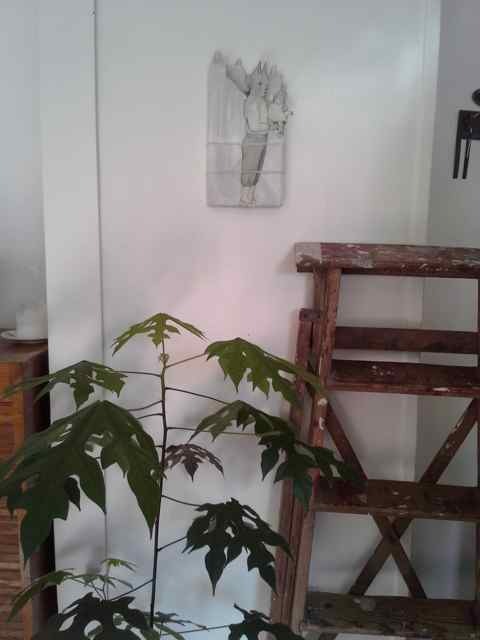 The Progress report show is over and I’ve taken a couple of Dreams home with me… Two now lives on the closet door and the pink dream sits next to a log bowl from Loyal Loot and three of my men – two ceramic ones by Jane Muir and an anonymous Italian in oil. Pink dream and three men. The Dreams collection can be viewed here. The future holds more Dreams in store and they’ll be travelling west in the spring! The next exhibition at manos will be ceramics by Elisabeth Ottebring, opens October 22nd. I managed to get home just before the storm – thick hails knocked on the windows and the rain was pouring down. Phew. Thank you for ordering so many of our “dreams”, we are delighted you like them! Most orders will be sent out in a couple of weeks time, when the show is over but the web only items are already on their way. I’ve wrapped them using bits of pages out of a book I was reading when I was last in Gothenburg, visiting Camilla. It was Evan Hunter’s “Mothers and daughters” and it was a really old copy, totally falling apart. I thought it looked nice like this. Pink Dream no 38 Bigger here. I’ve added a few more web only items, as well as a lovely pink piece – thick, creamy pink with a chocolate coloured dream on top. The Dreams are now available in manos webshop. Thank you all for cheering us along and giving us feedback. We want even more – this is a progress report – only a step on the way. We already know some things that we want to take further and we hope to take on board all the feedback we get from showing our work half way through the project. You will notice that not all the items are decorated – at least not so that you would notice. We are curious to see what you will think of this. We are vizualising the dreams together – some have clear faces and even stories built up when they come apart (or together) others are Zen-like, calming to go with the faces and the stories – or to be just on their own. Some items we have already placed together and the rest we leave up to you to mix and match. They like each other and we hope you will like them. It’s been a sweltering week in manos’ greenhouse, but the workshop keeps nice and cool. The shop re-opened on Thursday and I had a few stray visitors that even managed some shopping in the heat. The “progress report show” of mine and Camilla’s collaborative work is up and basking in the sun. People who have come to see it laugh and that makes us happy. See more of the “progress report show” here. The “Dreams” will be in the webshop on Wednesday afternoon, until then Ciao. I spent some days with Camilla working on what we’re calling our “DREAMS” collection (as in the delicate cookie with a touch of vanilla flavour or perhaps as in our dreams and aspirations) . This time around, we’re working more with tactility, integrating the patterns with the ceramic shapes, combining pieces into little sculptures… You’ll see and we hope you will like! The “progress report show” opens at manos Thursday August 6th and the pieces will be available in manos webshop on Wednesday August 12th. What sweet days we’ve had! Friday was private view for re-used at manos, Elisabeth, Camilla and I started the day with breakfast under the cherry blossoms at a café on Hornsgatan. The day just went by in a whirlwind and the private view was lovely! Here are a few pics. For dinner we went to Nuh’s at Hornsgatan – it’s a very long street . Saturday was spent strolling around town popping into shops like Karaktär,Mor Karin, Konst-ig, retro, bric-a-brac….and then Camilla and Elisabeth took the train back to Gothenburg. And now I’m working on the update of the webshop with the superb Studio Violet porcelain table ware. If you want to know when it’s up – send an email to karin@karineriksson.se or check back here. 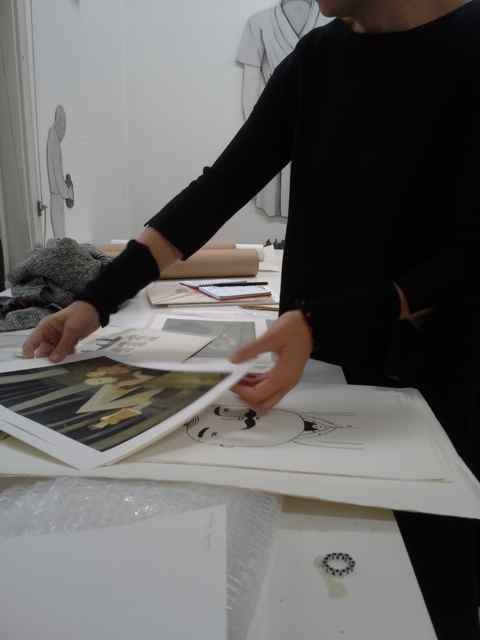 Janine has got wonderful images of the re-used show, manos and Scandinavia on flickr!